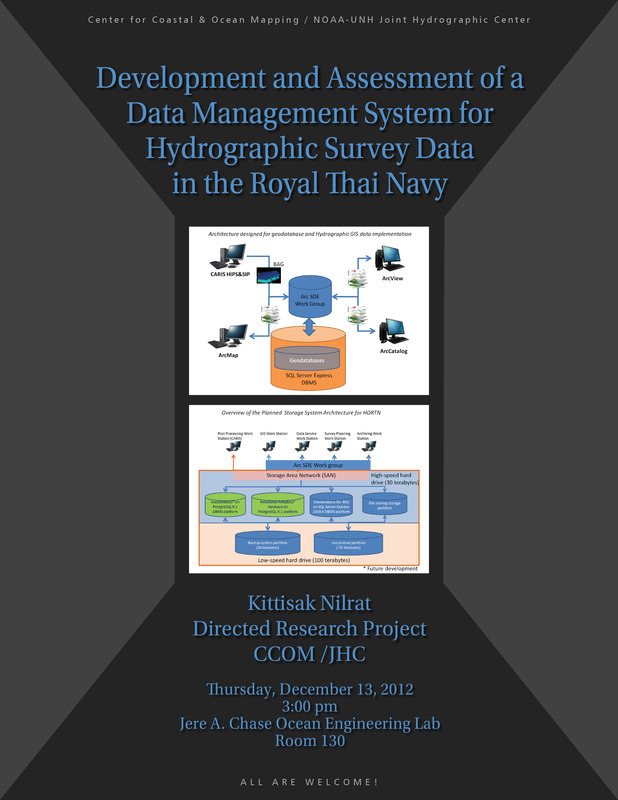 A prototype of a data-management system is developed with aiming to be used as guideline for actual establishment of a data-management system at Hydrographic Department of the Royal Thai Navy (HDRTN). Primarily the developed system is an XML metadata implemented based on ISO standards is a major tool used for capturing, containing, and serving the fundamental detail information of operational procedures that are implemented to the survey data through the data life cycle. Secondly, a Bathymetric Attribute Grid (BAG) format is chosen among various existing data formats to be a major format of validated modeled data, representing validated bathymetric data, because of its data-file components containing fundamental elements required for hydrographic purposes. Thirdly, various types of digital hydrographic data (e.g., validated depth points, contours, etc.) are modeled as Geographic Information System (GIS) geodatabase feature classes and stored centrally in the developed GIS data repository. Fourthly, geodatabases are utilized as hydrographic GIS data container, developed using Arc Spatial Database Engine (SDE) on a Microsoft SQL Server Express 2008 R2 platform. Additionally, Storage Area Network (SAN) is initially chosen for the development of the network storage system that allows data processors, connecting to the network, to store and back up the data easily. Lastly, the ArcGIS Server is a tool, chosen for presenting the servicing selected spatial data and metadata associated via the internet system. A multibeam dataset derived as a part of the Summer Hydrographic Field Course 2011, University of New Hampshire, is used for demonstrating the developed system. Initial demonstrations show that this prototype system is very useful and it can be actually developed at HDRTN. The demonstration present that the prototype system and designated implementation can make the hydrographic survey data being more valuable than traditional ad hoc system since it allows the hydrographic survey data: to be easily accessed, to be used for various researches and producing various additional products, to be understandable within data life cycle and lastly to be completely preserved for long-term usability. Lt. Kittisak Nilrat received a Bachelor of Engineering degree in Hydrographic Engineering from the Royal Thai Naval Academy in 2003. He has served with the Thai Royal Navy since 2004 and is now the Executive Officer of the H.T.M.S. Suk (Oceanographic Surveying Vessel) in the Surveying Vessel Group of the Hydrographic Vessel Division of the Royal Thai Navy’s Hydrographic Department.